Persistence Market Research offers an 8 year forecast for the global sports supplements market between 2017 and 2025. The primary objective of the report is to offer insights on the advancements and opportunity in the sports supplements market. The study demonstrates market dynamics that are expected to influence the current challenges and future status of the global sports supplements market over the forecast period. This report also offers updates on trends, drivers, restraints, value forecasts, and opportunities for manufacturers operating in the global and regional sports supplements market. By product type, the market is segmented into non-protein products and protein products. The protein products segment is expected to dominate the global sports supplement market owing to its larger requirement in terms of consumption resulted by benefits related to it. Increase in performance, mass gain, and improved functionality while using protein supplements has resulted in a larger consumer base for the same. Further, the non-protein is sub-segmented as Amino acid, Creatin, and Beta-alanine and L-Carnitin. And protein segment is sub-segmented into powder, bar, ready-to-drink. By distribution channel, the market is segmented into fitness club, health food stores, online stores, pharmacy & drug stores, and supermarkets. The health food store segment is expected to dominate the global sports supplements market over the forecast period this is attributed by the ease of access and deeper penetration of sports supplement through such sales channels. The report includes market share of each segment according to the region with analysis towards market trends respectively. A section of the report highlights sports supplements production and demand region wise. It also provides a market outlook for 2017–2025 and sets the forecast within the context of the sports supplements ecosystem, including the new product developments as well as product offerings in the global sports supplements market. This study discusses key trends contributing to the growth of the global sports supplements market, as well as analyses the degree to which drivers are influencing the global market. In the final section of the report, a competitive landscape has been included to provide report audiences with a dashboard view. Detailed profiles of the providers are also included in the scope of the report to evaluate their long-term and short-term strategies, key offerings and recent developments in the sports supplements space. In addition, it is imperative to note that in an ever fluctuating global economy, we not only conduct forecasts in terms of CAGR but also analyze on the basis of key parameters such as year-on-year (Y-o-Y) growth to understand the predictability of the market and to identify the right opportunities. Also, another key feature of this report is the analysis of all key segments in terms of market attractiveness. This is traditionally overlooked while forecasting the market. However, market attractiveness is critical in assessing the level of opportunity that a provider can look to achieve, as well as to identify potential segment from a sales and delivery perspective in the global sports supplements market. The global sports supplements market to witness steady growth over the forecast period owing to increased usage of fortification product, globally to attain a better functioning body and cure lifestyle-related diseases. Rigorous marketing campaigns by manufacturers and internet of things have put sports supplements products into the mainstream. This is expected to drive the growth of the sports supplements products over the forecast period on a global scale. 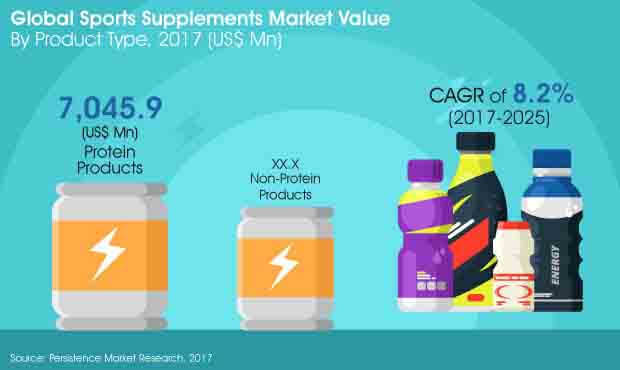 Revenue generated from sports supplements market is estimated to be valued at US$ 9,555.4 Mn by the end of 2017 and is expected to increase at a CAGR of 8.2% over the forecast period. Global Sports Supplements market is expected to be valued at US$ 17,963.7 Mn by the end of 2025. Consumers are embracing practices such as gym, yoga, and healthy food consumption as self-medication and in order to lead a healthy lifestyle. This has led to an increase in demand for health-related products such as organic food and dietary and sports supplements. Increased usage of self-analysis kits and self-diagnosis for deficiency has increased demand for sports supplements in developed regions. Establishments like gym, fitness clubs, yoga centers and other facilities endorsing sports nutrition products are anticipated to contribute hugely to the increment of demand of sports supplement and other related products over the forecast period. Such partnership with establishments increases sales point for the products and narrow down the targeted consumer for the manufacturers and distributors. The higher occurrence of sedentary diseases and increases the risk of such diseases in urban regions is expected to drive the consumer to adopt a more supplement based lifestyle to curve out the issues. This, in turn, is expected to fuel the demand for the sports supplement over the forecast period. Fortified foods and beverages containing an equivalent amount of nutrients and minerals per serving against sports supplements are expected to create restraint for the sports supplement market over the forecast period as the fortified food foods are easy to adapt to daily lifestyle than supplements. The protein products segment in the product type category is estimated to be the largest and highly lucrative segment. The consumption of protein products in sports is consumed for nutrition and energy, and the consumption rate has been observed to rise in the coming years. Since past several years, protein products have been a favorite nourishment source for players, sportsmen and common individuals. In 2017, the protein products segment was valued at about US$ and is estimated to reach a valuation of more than US$ . The protein products segment is projected to grow at a CAGR of throughout the period of assessment. Protein products segment is further categorized into powder, bar and ready-to-drink sub segments. The powder sub segment in this category is expected to largely contribute the growth in valuation of the parent segment. This sub segment is projected to grow at a significant rate during the forecast period. Also, contributing the growth of the protein products segment is the bar sub segment, that is projected to grow at a higher rate to register a CAGR of 8.6% throughout the period of assessment.